Testing the Epson Perfection V330 Color Scanner was enjoyable, but raised the same questions that have come up before: namely, what separates this from countless other scanners - most of them from Epson? Not a lot that we could see, except it didn't come with Photoshop Elements (like some other versions of the Perfection) and it was a lot cheaper (possibly because it doesn't come bundled with Photoshop Elements). It also doesn't include a holder for medium-format negatives as some other Epson scanners (such as the Epson Perfection V500 do. The scanner was fairly unremarkable, but not in a bad way. A special holder allows negatives or slides to be scanned with excellent results; and the Epson Scan interface allows basic adjustments (unsharp mask, grain reduction, color restoration, backlight correction, and dust removal) to be done during the scan, which can save a lot of time if you have a lot of negatives or slides to scan. The scanner is fast if a bit on the noisy side. Colors on negatives and slides, in particular, were excellent, thanks in large part to Epson's ReadyScan LED technology - it not only reduces warm-up time but also provides truer colors. Scans are relatively fast, but of course, that depends on the resolution at which you scan (up to 12,800 dpi, which will take a long time and produce a gigantic file). Scans at 300 and 600 dpi looked just fine and the images were only 30-40 KB. You can batch-scan photos simply by placing them more than 2 mm apart, with each scanned to a different file; that can be handy for those looking to scan a lot of images. The scanner can scan directly to PDF or e-mail with a single press of a button. A high-rise lid allows 3-D objects to be scanned easily. The software bundle includes Easy Photo Fix, ArcSoft Scan-n-Stitch Deluxe (so you can stitch two scans together), ArcSoft MediaImpression, and ABBYY Fine Reader. Abby Fine Reader is a fine optical character recognition, or OCR, program for converting scanned text to editable and searchable formats. During most OCR conversions, when we scanned documents with mainstream fonts and few graphics, often the conversion was 100 percent or zero errors. The scanner does have a very large footprint, which on the plus side allows large photos or documents to be scanned easily; on the downside, it does take up half of my desk. One tremendous nuisance is that the power and USB cords plug into the front corner of the printer rather than the back. Since most peripherals have their cords plug into the back, you may find (as I did) that it's a huge inconvenience to have the plugs in front, since it means wires can't easily be hidden. 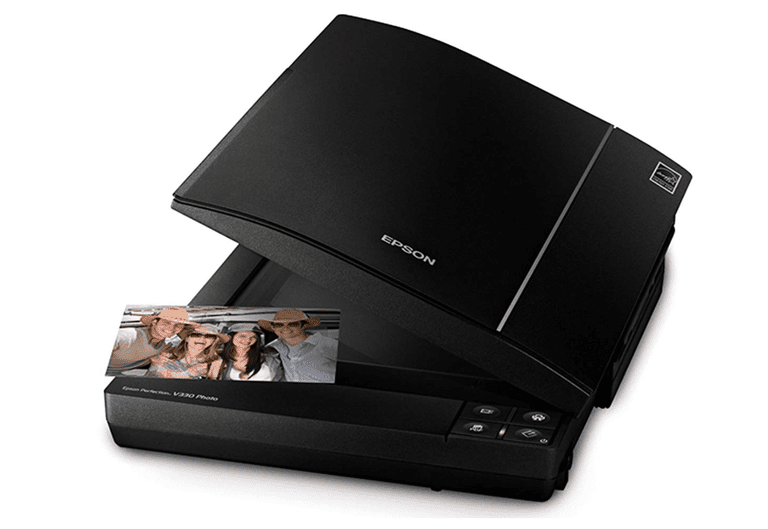 The Epson Perfection V330 Photo Scanner works well for scanning documents as well as photos and negatives. Its built-in photo-management software allows you to do some decent photo restoration (fixing colors, adjusting for dark backgrounds, and so on) while photo-stitching software gives the opportunity to splice several photos together. If only the power and USB cords plugged into the back rather than the front, it would be excellent.